Oh my gosh... Excitement alert!! Every year, my cousin's school does an AWESOME fundraiser for their special education program. The fundraiser event includes a silent auction and I've donated a few baskets in the past. This year, I am IN LOVE with my basket idea. I put together a basket of craft supplies with instructions to make the various crafts. 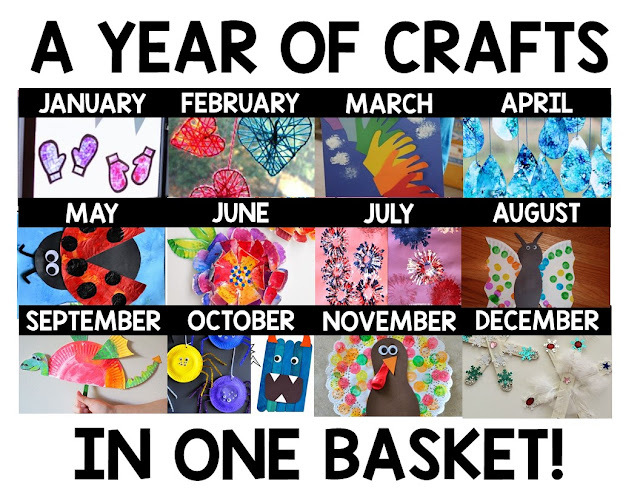 The basket includes a craft for every month of the year and ALLLLL of the supplies needed to make each craft! To create this basket, I took to Pinterest and found a fun, simple craft for each month of the year. I came across some TRULY FABULOUS blogs an consolidated their craft instructions into a simple document. I want to be clear.... These crafts were NOT created or developed by me! Below, you will find links to all of the blogs that I collected the ideas from. Grab the directions for the crafts by clicking this link: A Year of Crafts Directions. Now, when I first set out to create this basket, it was rather daunting... I had to find the crafts, make the list of supplies, consolidate all of the directions, shop for the materials, and assemble the basket. This blog post helps you to create your own basket WITHOUT all of the prep work! All you need to do is SHOP for the materials and ASSEMBLE the basket! Simply print all of the craft instructions from this blog post, here. I also wanted to make the shopping process a little bit simpler for you! Here is a link to a shopping list and suggestions of where to find the materials! In total, this basket cost me about $100.00 to put together. I hope that you found this blog post and idea helpful! I can't wait to donate this basket to our fundraiser in April!